Utica (NY), United States – A new Rotary Continuous Mixer model CM-16X4-SS from Munson Machinery provides continuous, high-capacity mixing of bulk materials with or without liquid additions at low cost per volume of output. Powered by a 0.37 kW explosion-proof motor, the mixer consists of a 41 cm diameter by 122 cm long cylindrical drum with fixed internal mixing flights that impart a gentle, back-flow mixing action free of dead spots. 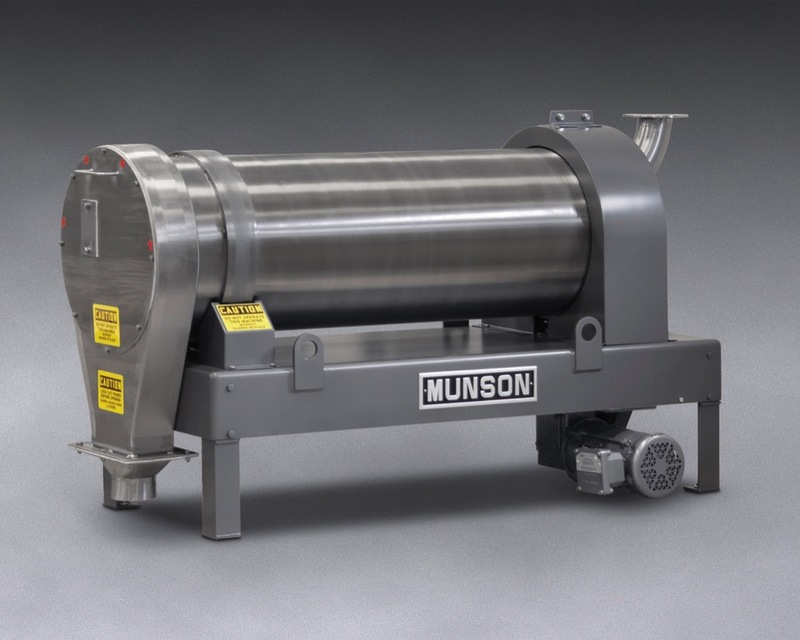 Munson Rotary Continuous Mixer blends 2.4 to 1.2 cubic meter per hour of material in one to two minutes with or without liquid additions, depending on application. Uniform distribution of particles is attained in one to two minutes typical, yielding capacities of 2.4 to 1.2 m3/h. Heavy-gauge mixing flights of the stainless steel machine impart a four-way mixing action that maximises uniformity, while minimising degradation and abrasive wear. Optional stainless steel piping with spray nozzles distributes liquids evenly onto cascading material without overspray onto drum surfaces, according to the company. The stationary inlet and outlet at opposite ends of the drum can be hard piped to upstream and downstream equipment. Dust is contained by outboard seals designed for rapid replacement. The mixing drum rotates on heavy-duty hardened steel or Nylon “trunnion rollers” external to the mixing cylinder, eliminating the maintenance, product contamination and cleaning difficulty associated with internal shaft seals that contact material. An optional “reversing weir” at the mixer’s outlet allows virtually complete discharge of blended material at the end of a product run, facilitating rapid changeover. On this and other small models, the internals can be completely removed for cleaning or inspection.